A 39-year-old woman who died in a fire in Aberdeen has been named. 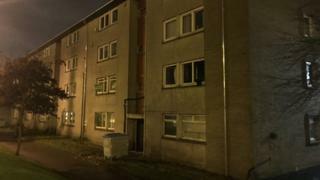 Victoria Eighteen died after the fire on the first floor of a four-storey building in Shapinsay Square on Monday night. Police Scotland said the fire was being treated as non-suspicious. Det Insp Norman Stevenson said: "Our thoughts are with Victoria's family and friends at this very difficult time."